Heat oven to 350°F. In 12-inch skillet, cook beef over medium heat 8 to 10 minutes, stirring occasionally, until brown; drain. Stir in black beans, pinto beans, tomatoes, taco seasoning mix and water. Cook 2 to 4 minutes, stirring occasionally, until heated through. Stir in 1/2 cup of the cheese. In 8-inch square (2-quart) glass baking dish, spread 2 cups of the beef mixture. Top with half of the tortilla strips. Spoon half of the remaining beef mixture over tortilla strips. Add remaining tortilla strips; top with remaining beef mixture. Bake uncovered about 30 minutes or until bubbly and heated through. Sprinkle with remaining 1/4 cup cheese. Bake about 5 minutes longer or until cheese is melted. Cut into squares. 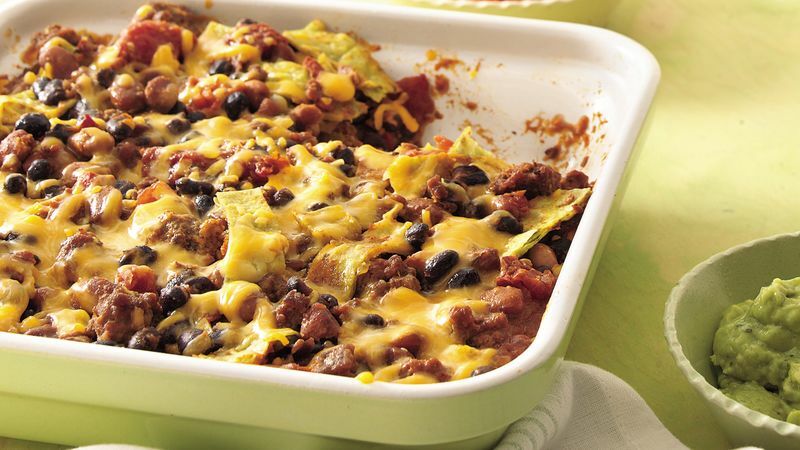 Top this Tex-Mex casserole with your favorite taco toppings: sour cream, tomato, guacamole and/or salsa.